Why Are Shapiro Facelifts Better? Our Phoenix facelift is designed to elevate sagging tissue and address many effects of facial aging, including lost definition, marionette lines, and nasolabial folds. Facial aging is similar to the movement of a glacier. It is the migration of facial fat over time, which drags the skin as it goes. The skin’s elasticity degrades over time as well, so it cannot resist the pull of gravity as it once did. This is what causes the deep folds surrounding your mouth and nose-those wide smile lines-and what causes the hollowing beneath your eyes, the jowls sagging from your jaw, and the excess skin in your neck. This is where Dr. Shapiro comes in. An expertly crafted, truly beneficial facelift demands a mastery of the intricacies of facial anatomy, mature aesthetic vision, detailed procedural planning and execution, and a passion to provide each individual with the most outstanding results possible. Board-certified plastic surgeon, Dr.Daniel Shapiro, possesses all of these qualities and achieves the best results in a facelift Scottsdale has to offer. The general facial structure is divided into thirds. The upper third of the face includes the eyebrows and forehead, which are addressed by a brow lift. The middle is considered the area of the eyes, including upper and lower eyelids as well as the areas just above and below. These are addressed by eyelid surgery, or blepharoplasty. The bottom third includes the facial area below the eyes including the cheeks, jawline, and neck. It is addressed by a facelift. Your consultation will take place in Board-certified Scottsdale plastic surgeon, Dr. Shapiro’s, comfortable office. During that appointment, he will review your medical history, discuss your goals and answer any questions you have about the procedure and recovery. He will also discuss the expected outcome, the details of your procedure and techniques that will be used. A mini lift, also known as a cheek lift or a limited incision facelift, is best for our younger Paradise Valley patients with good skin elasticity and mild facial aging. Indicators for this criteria would include early cheek laxity or minimal jowls. The mini facelift addresses the appearance of the cheeks but does not include the neck like a full lift does. Our mini Phoenix facelift is a minimally-invasive, rather minor procedure with incisions placed inconspicuously along the inside of the ear cartilage. It can be performed under mild sedation in Dr. Shapiro’s Phoenix office and the patient can be discharged post-operation. This procedure involves three or more small incisions to remove excess fat and reposition tissue. It can reduce minor sagging of the neck and face by targeting the lower third of the face. The procedure typically takes 1-2 hours. A standard facelift, or rhytidectomy, is best for our Scottsdale patients with more advanced signs of aging. For most patients, the issues addressed with a standard rhytidectomy are sagging jowls, loose neck skin, and double chins caused by excessive fat accumulation. Contrary to popular belief, the standard procedure is not meant to pull the skin into place, as this results in excessive tension and often produces even more sagging when the skin is unable to maintain its new position. 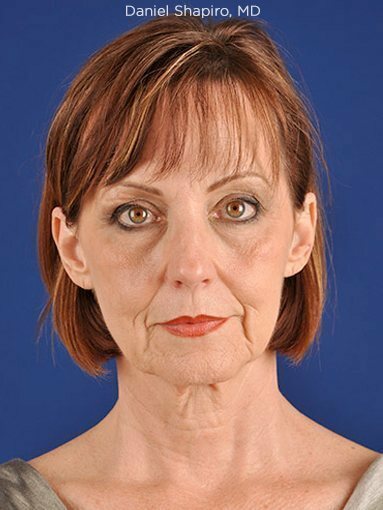 Dr. Shapiro’s Scottsdale facelift will never give you a “windswept” look by pulling the skin too tight. Instead, he will address the facial fat in combination with a subtle readjustment of the skin. With his attention to detail and professional care, you will not have a masked look to your face, a distorted hairline, or visible scars. Instead, you will get a natural looking result with as minimal scarring possible. This procedure results in rejuvenation of all of the layers of the face with tension directed away from the skin. It typically produces very long-lasting results. 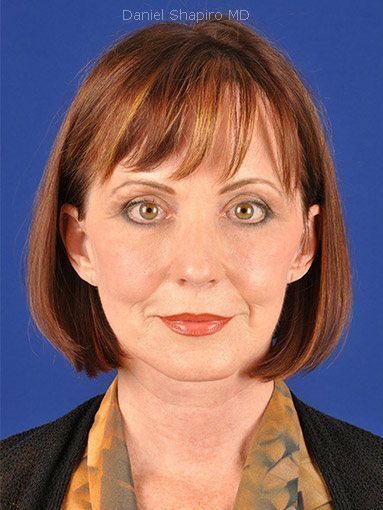 The facial fat that has since migrated south is removed and restored to its natural environment, lifted atop the cheek bones. The result is a youthful and full facial contour. The jawline and neck are also cared for in the same manner. It is often said that the surgeon’s signature is made of the scars that he leaves. In this case, Dr. Shapiro, a Scottsdale surgeon, is the invisible man. Because there is no tension on the skin with a contemporary face lift, the incisions heal inconspicuously with no obvious signs of the surgeon’s presence. On the day of surgery, wear loose, comfortable clothing with a button-down shirt. Plan to have someone with you who can drive you home and stay with you for the first two days. Stopping smoking for two weeks before surgery will promote better healing, proper recovery and the best results in a facelift Scottsdale has to offer. Occasionally, further improvements can be made by using gentle liposuction to remove extra fat from the neck. In other cases, using fat injections will help restore youthful volume to the cheeks. Other options include a total face rejuvenation, also called a complete or total lift. This procedure would address all three sections of the face at once for a balanced and natural result. Sutures are removed within seven to ten days after surgery. Patients can comfortably socialize approximately two weeks after surgery. Minor bruising and swelling will typically resolve in two to three weeks, although this varies. Most patients feel well after a few days, but choose to stay home until these side effects resolve. Avoid aspirin and anti-inflammatory medication for the first two weeks. Take any medication prescribed by Dr. Shapiro as instructed. Sleep with your head elevated for two weeks. You may apply cool compresses to your eyes to minimize swelling, but do not apply ice or anything very cold directly to your skin. Avoid lifting anything heavy or bending for the first week. The results of your procedure can last seven to ten years. When maintenance is desired, it is often just tightening in the cheek area. You will continue to age after surgery, but you will still typically look five to ten years younger than you would have if you did not have the procedure. There is no “right” age for this procedure, although the typical patient is in his or her 40s or 50s. An ideal candidate is in good physical health and near his or her ideal weight, a non-smoker, and free of any health conditions that may increase risks, such as high blood pressure. The ideal candidate will also have realistic expectations and is not taking medication that may increase risks. The best way to determine if you are a good candidate is to consult with an experienced Arizona facial plastic surgeon like Dr. Shapiro, who offers arguably the best facelift Scottsdale has available. This procedure generally takes four to six hours to complete. Recovery from this surgery takes about two weeks, although it depends on the severity of the corrections. Swelling and bruising may occur, but this typically fades within two or three weeks. Most of our Phoenix patients return to work within two weeks. Exercise and strenuous activity should be postponed for up to six weeks. As with any surgery, there are risks with a rhytidectomy. Potential complications include excessive bleeding, infection, hematoma, nerve injury and delayed healing. Most patients return to work within 2 weeks of a rhytidectomy. Even the best facelift procedure will leave scars, but they will be well hidden and inconspicuous within the hairline and natural creases of the ears. Scars may appear red for the first four to six weeks before fading. It will take at least one year for scars to achieve their final appearance. Schedule a consultation for arguably the best facelift Paradise Valley has to offer with Dr. Shapiro, a renowned facial plastic surgeon. Please our contact form to get in touch.